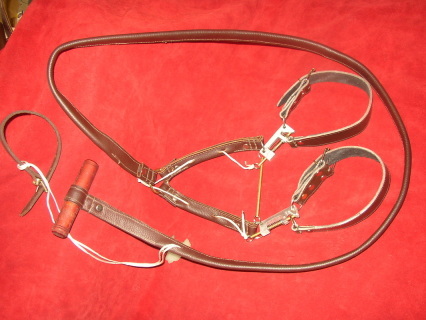 Hand made quality leather single hound quick release slip set direct from the manufacturers workshop. Our own unique aluminium block and pin type release system with cord passing through lead to wooden handle for easy release of the dog. 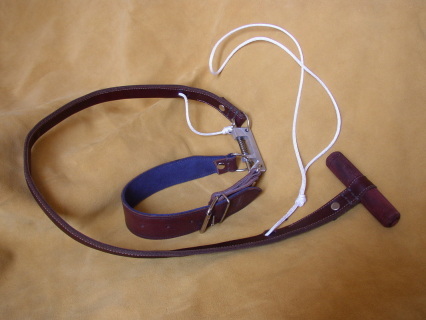 Standard handle to clip size is 34" (88cm) approx with a 2 inch (5cm) wide suede lined collar in neck size 13" to 18"
Both handle length and collar size can be made to other lengths. We have made and sold hundreds of these over the past 30 years and so it is tried and tested. Open design makes easy maintenance - a quick scrub and all that is needed to get rid of mud , etc, avoiding all the problems with traditional slips. Wrist cord for easy use - simply strap it on and then let go of the handle when you want to release the dog - it pulls the cord, releases the clip and gives a smooth start for racing, lure coursing or simply training. We can supply a second one to make a pair. We also make a double slip lead - see below. Slightly lighter version of the slip above - handle usually slightly longer and the adjustable collar is 1" wide and made for neck sizes 11" to 14"
​Standard handle to the dividing V is 34" (88cm) approx leading to two 2 inch (5cm) wide suede lined collar in neck size 13" to 18"
​THIS CAN ALSO BE MADE IN THE SMALLER SIZE FOR SMALLER HOUNDS .